A brilliant damaged girl, a passionate, political boy. A group of four friends- the Liars- whose friendship turns destructive. 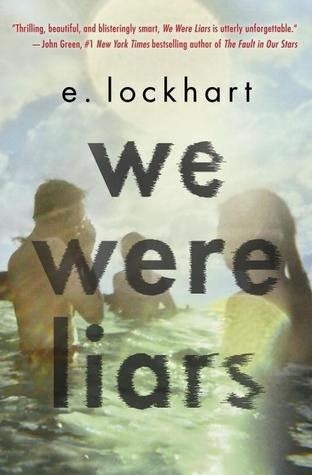 Review: Having recently attended a blogger brunch I had heard about the impact that We Were Liars was making amongst bloggers and readers alike. When I received the email about the #liarsliveread that @HotKeyBooks were doing I instantly thought this could be good fun, and it sure was. The downside for me was that I was working. So I decided to start reading We Were Liars on my bus journey into work. So that when 1pm hit I could join in with a few of my reactions alongside the lucky readers who were at home and able to constantly update and enjoy reading. Seeing others reactions did not spoil my reading as no one was giving away actual spoilers. If you've read it you'll know that it's pretty hard to spoil any actual details as it is generally one of them books that has you guessing throughout and no matter what you guess you'll be wrong. If you guess correctly you need a star as you're a lot smarter than me and anyone else I know who has read it. Although reading other bloggers reactions made me eager to read and to get to specific pages to see if I was shocked or intrigued or just generally confused. These are just a few of the emotions that this rollercoaster short and intriguing contemporary read takes you on. Before I started We Were Liars I didn't know what to expect or what emotions or reactions I would go through in reading it. This book can and should be read quite quickly. That is my only annoyance the timing that I started reading as I was not at home to just read and read. I haven't read a book that has intrigued and confused me in a long time. The last book that had me thinking OK what the hell like this has, was Ian McEwan's Enduring Love which I studied for A Level English, and now I am 30 years old so it's safe to say that was a long long time ago. One of the quotes on the front of my proof copy says "Lockhart has created a mystery with an ending most readers won't see coming, one so horrific it will prompt some to immediately return to page one to figure out how they missed it." I have to be honest I did retrace my steps but I would never have guessed the outcome. A real page turner from start to finish. Cadence is an intriguing young woman, learning about life, family values and love. She goes through a lot of emotions and as a reader I feel that I warmed to her voice quite quickly. But I was constantly asking myself questions, questions that I won't state as they could ruin your enjoyment of We Were Liars and my review is not meant to do that at all. Lockhart has created a mystery that is clever and confusing yet a total joy to read. We Were Liars was so addictive that I found myself agitated when I didn't have the time to read, or when I was disturbed as you really do need to concentrate as parts can be confusing at times. I really enjoyed the live read and I look forward to and hope that Hot Key Books do more of these. Although I want to be on a day off so I can fully get stuck in on the tweeting action. The saddest thing for me about finishing We Were Liars is the person I would have passed this book onto is no longer with us. My Grandad Sam passed away in April, we both shared a love of reading and intriguing reads like this would be books that I could share with him. I would have loved to have let him devour it and over tea and possibly cake we would have had our discussion of our thoughts and feelings. Thank you so much for the comment. Have you read We Were Liars? Thank you I just wish I could discuss with him. He'd have liked it i think. The writing is smooth and well done. The story is clever and the twists along the way are well hidden, and offer the reader (gasping) surprises, and the ending caught me completely off guard. I'd never read anything by this author, but she's worth watching (and reading! ), and I'm going to check out her other books. Not the same old story. I could not put it down once I started reading. I will definitely recommend to my friends.